An online survey is under way to discover which vehicles have the worst brakes on British roads - our readers have been asked to help. According to the Department for Transport 1-in-3 road accidents happens because a vehicle fails to stop in time. This survey could reveal why some of these accidents happen - and how they can be avoided. The survey is designed to find which vehicles have poor stopping ability, brake discs that wear out early, judder, warp or suffer brake fade. Results of the survey will be made public and supplied to the Car manufacturers involved. A free copy of report will be supplied to all motorists filling in the online survey which takes about two-minutes to complete. The survey was requested by Mail order specialists, Car Parts Direct which has seen a huge increase in the number of vehicles requiring brake discs early because of defects in the original brakes fitted. Mark Cornwall of Car Parts Direct said, "We regularly supply upgraded brakes for vehicles where our customers tells us the original brake discs fitted wear out early or fail to provide adequate stopping. We already know which vehciles we are supplying the most replacement discs for, but this survey will confirm it." Mark Cornwall believes some car manufacturers are fitting brake discs that are unable to cope with the performance of modern vehicles. 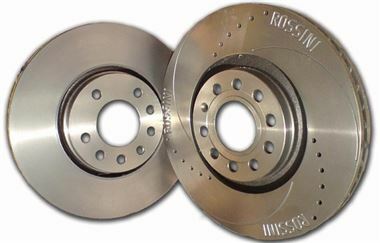 He claims an increased number of drivers are ordering their more expensive Rossini drilled and grooved performance discs, rather than fitting their standard brakes - especially after they have experienced a dangerous brake fade problem, warp or juddering. Cornwall added, "Brakes are the most safety critical part on any vehicle. The original brake discs fitted should be made to highest standards available - and possibly drilled and grooved for added safety. Motorists should not need to upgrade - but many do."